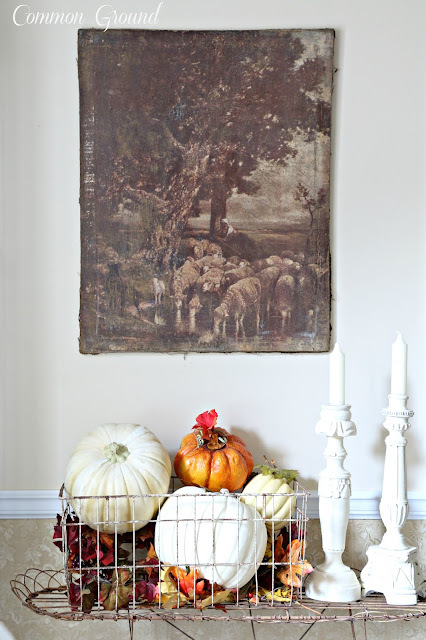 Today I wanted to share the rest of my Autumn Dining Room with you. I always think the house is the happiest in the Fall. The warm Fall hues are my favorite, and when the house is decked out in all it's Autumnal Glory, it's like slipping in to a new comfy sweater. 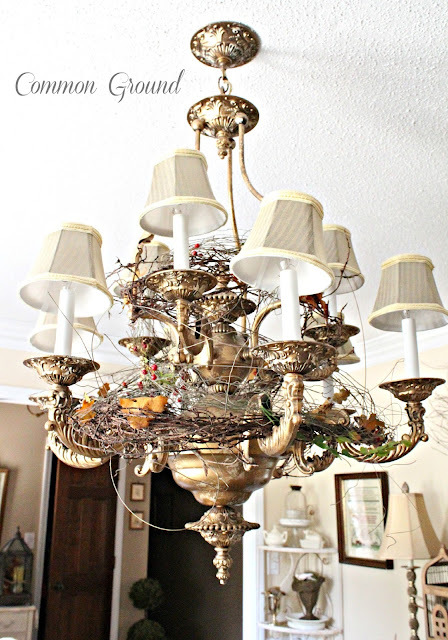 was to wrap my heavy chandelier in vines and twigs. 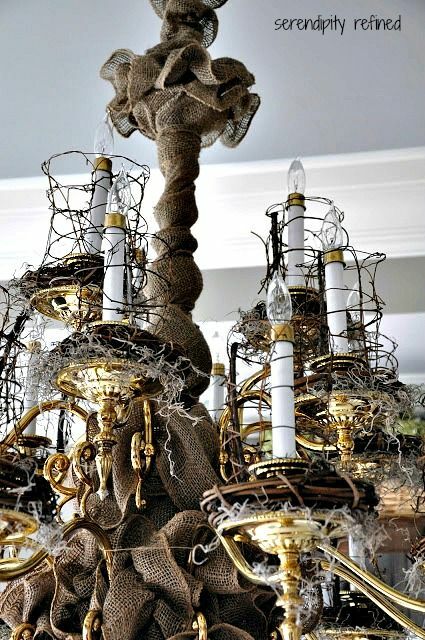 I fell in love with Kimberly's rustic burlap and vine wrapped chandy from last year at Serendipity Refined. And while mine isn't nearly as involved with the burlap and moss, I DID want it to have that same "feel" of "rustic and woodsy". 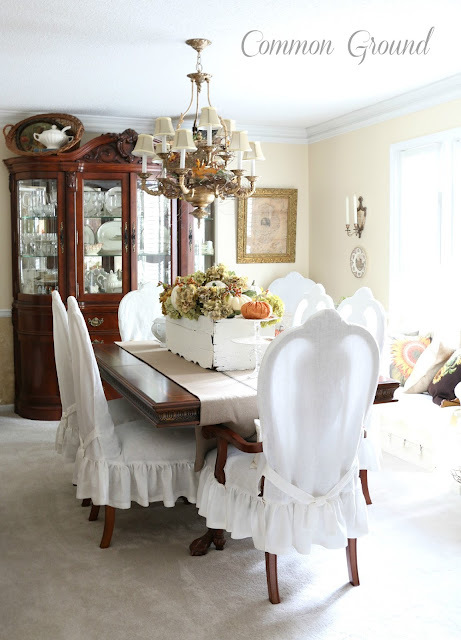 Kimberly's wonderful dining room transformation. I just started out with 3 of these preserved twig garlands. These happen to have small red berries, so I can leave them for Christmas and winter. I added in just a few preserved leaves for some color. 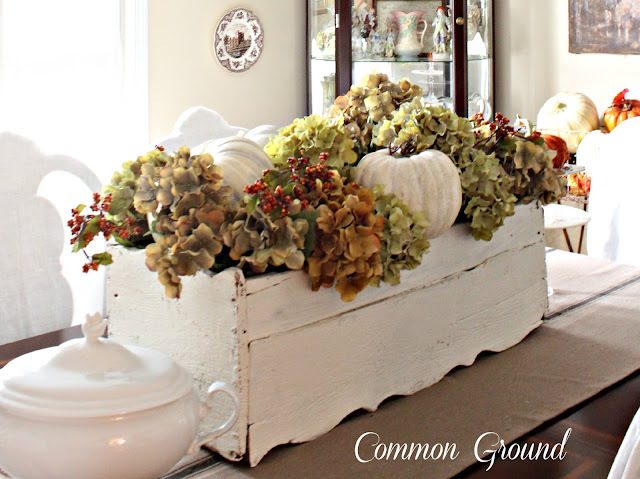 My chippy white window box centerpiece didn't change much from last year, I just used a mix of real and faux hydrangeas, and white faux pumpkins. I found a stash of faux hydrangea bushes at Michael's in the clearance bin so I went crazy. I think I bought about 10 bushes, at about 6 dollars each. They were a little off color being a greeny-brown, so I just took them outside and lightly spray painted them in antique white. It gave a softer, more "dried" look to them. Then I added some orange-y berries for some more Fall color. I've found that if I crumple up brown paper bags and put them in the window box first, then add the flowers and pumpkins my pumpkins don't "disappear". This is a super big windowbox and needs a lot of "stuff" to look full and lush. that's one reason this room is perfect for Fall. I found at Leola's Fall Open House a couple of weeks ago. 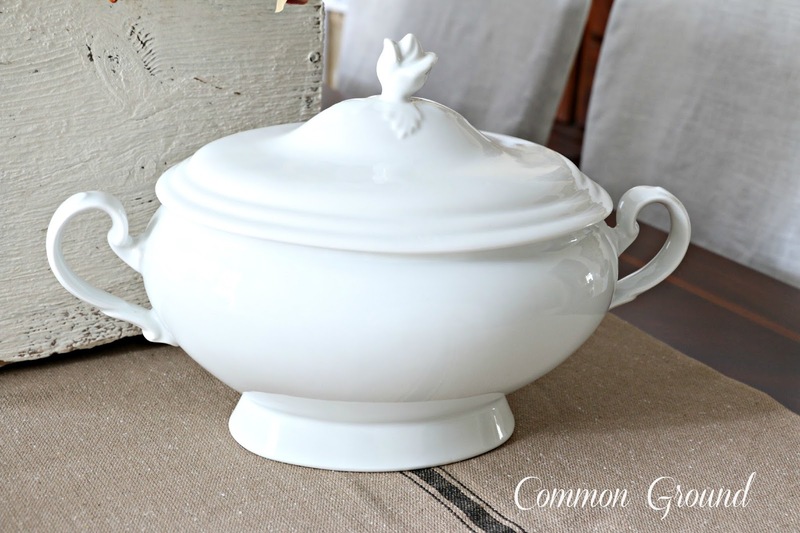 I just can't pass up a beautiful tureen, especially at a great price. from last month's sideboard are in here for now. that more leaves, vines, berries and pumpkins will be added. 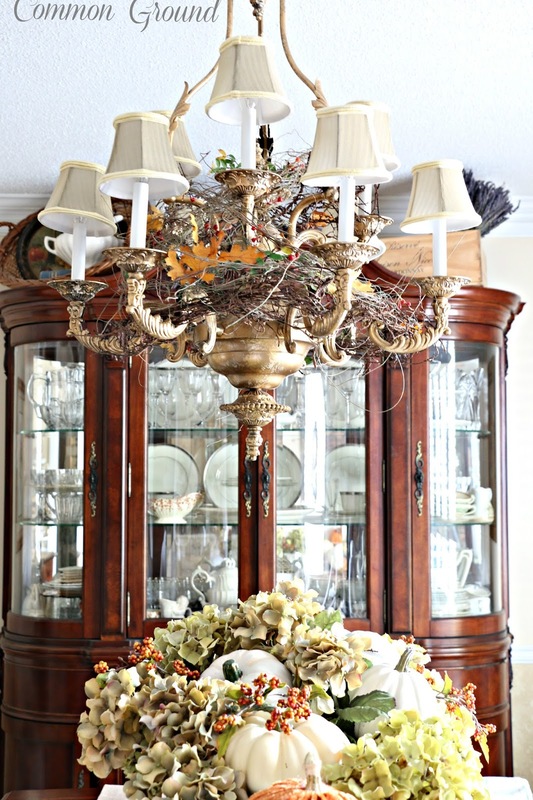 Click Here to see part 1 of my Dressed for Autumn Dining Room. So what new things are you trying this Fall? here each Thursday and Friday. Luv your twiggy chandelier Debra. The dining room is so cozy and warm. 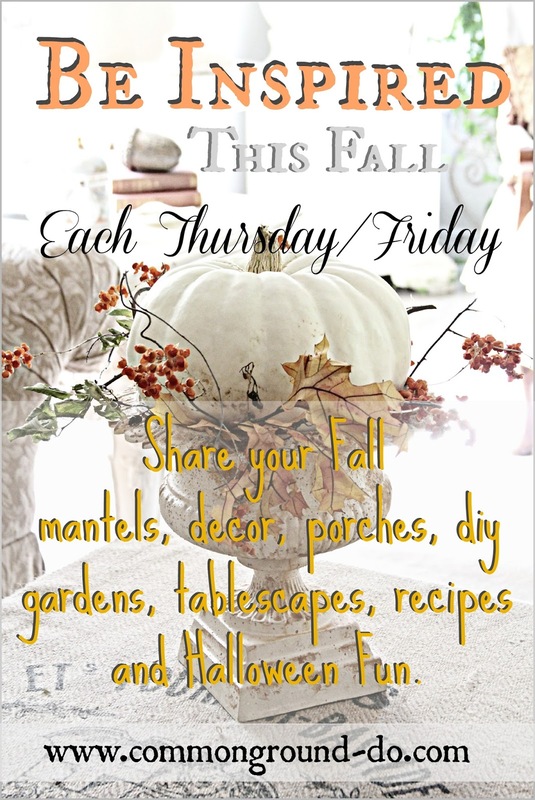 I agree... Fall is the best time, when everything in the home looks so cozy and warm.. so inviting. Your home is so beautiful and I LOVE that windowbox!! Happy FALL!! Did you hear me screaming? I thought I loved the chandelier best, then it was the window box, and then came the fabulously simple, but oh, so beautiful chair vignette. I love love love the window box. I think that needs to be on my table!!!!! The chandelier all decked out looks great too. Great job Debra. Love it all. Debra, your chandelier is so pretty! And that box is fabulous! I love to use hydrangeas in my fall decorating; and yours are gorgeous! What a great place to enjoy a Fall meal! Debra, the chandelier looks gorgeous!!! Love the berries so much. Love the box too...I have to put layers of florist foam in mine because it is also deep. Beautiful dining room! your dining room looks lovely. i really love that sheep tapestry piece, if it's missing, i stole it. Everything looks so pretty. I love the additions to the light. Your home is always so beautiful! Your room looks gorgeous! You're all ready to host Thanksgiving!! Love all the warm, earthy tones. Nice job!! Beautiful, Debra, just incredibly beautiful! What am I doing? I'm painting pumpkins. I don't have the chalk paint everyone seems to love. But I'm painting them just the same! Your twiggy chandelier is gorgeous, Debra!! That changes the mood of your whole dining room. WOW! Magazine worthy photos! 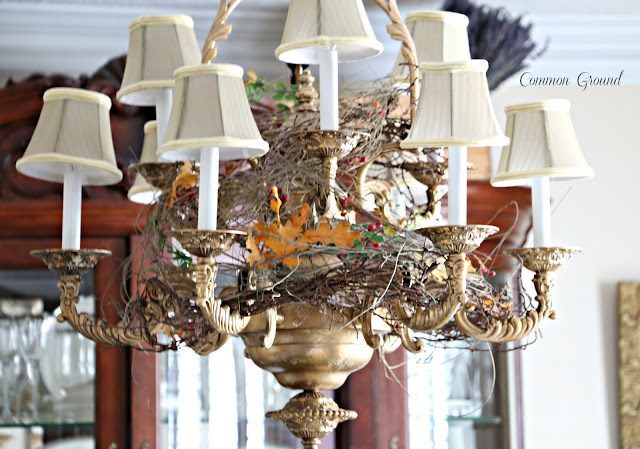 Your chandy looks amazing and I always find inspiration for seasonal decorating here. Thanks! Debra...you missed your call as an interior decorator! Your chandy is beautiful, I just love the vines. And your flower box is jam packed with prettiness! This should be on the October cover of BH&G! I have been poking around in my bins, but garden clean up has my full attention right now. Soon! Absolutely awesome - your rooms look WONDERFUL!!!!! I am truly inspired, per usual! Love the chanty - really looks wonderful. 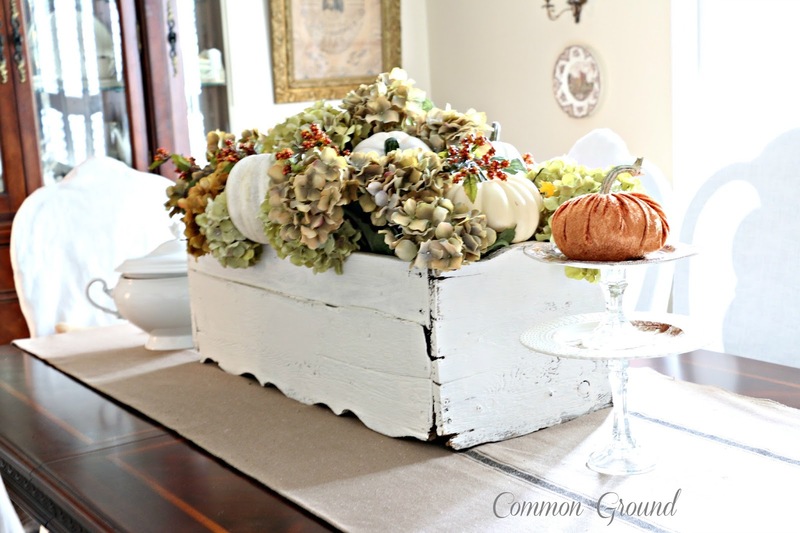 The table is great with your window box all decorated. Great fall look! It's just beautiful, Debra! My dining room table is a mish-mosh of papers and bills right now. I need to get my act together! It all looks so pretty, Debra! I love how you did your chandelier. 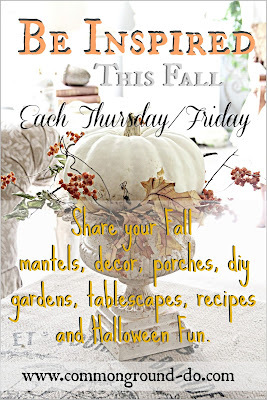 I'm headed up to the attic today to get my Fall and Halloween bins down to start my inside decorating. Not sure what I'm going to do with it yet, but I seem to move things around from their original position anyway. It looks fabulous! I'm keeping decorating simpler this year because of a couple big shows I'm doing but I am sure enjoying looking at everyone else's efforts! Your dining room is beautiful! I love the additions to the chandy, the box centerpiece is also gorgeous. So so beautiful Debra! Everything sings the most beautiful part of fall. 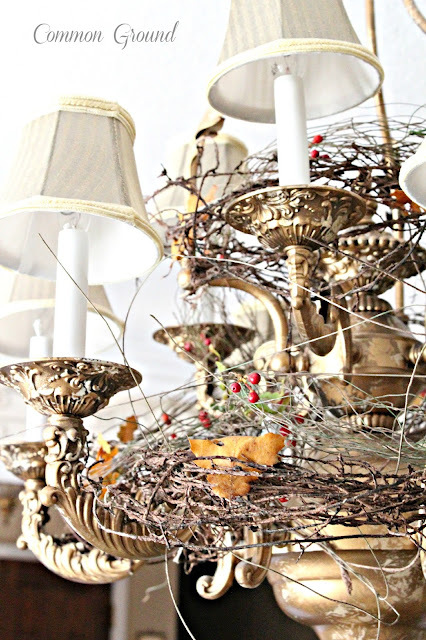 Brambly twigs, pumpkins, hydrangeas along with chandy's and fine china. What a mix! 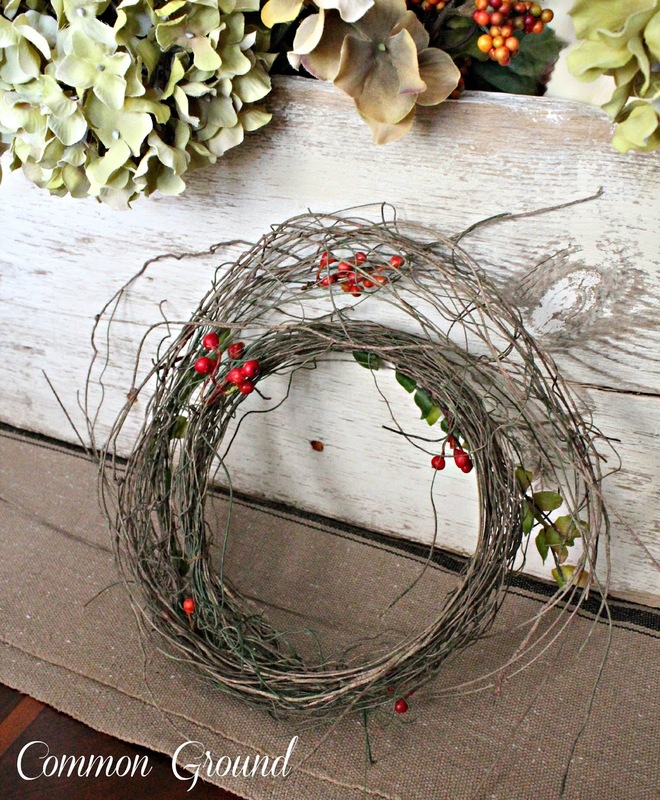 You certainly have an eye for my favorite style Rustic Luxe!!!! Just stunning! Debra, as always everything is just amazingly gorgeous....thank you for all of the inspirations! 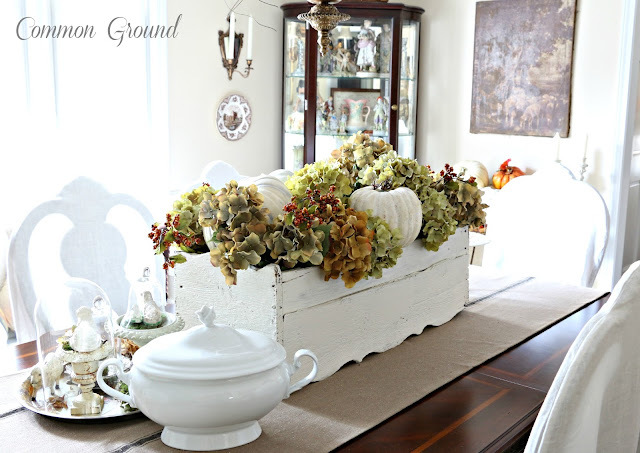 I just adore your beautiful dining room all dressed up for Fall! Love the mix of elegant and rustic! It looks so cozy and romantic! It's all just lovely, and puts me in the mood to change even though we're still having summer here in Texas! Your festive touches for fall are so very pretty. I love the chandelier, it's perfect. Takes my breath away, Debra. Autumn perfection! 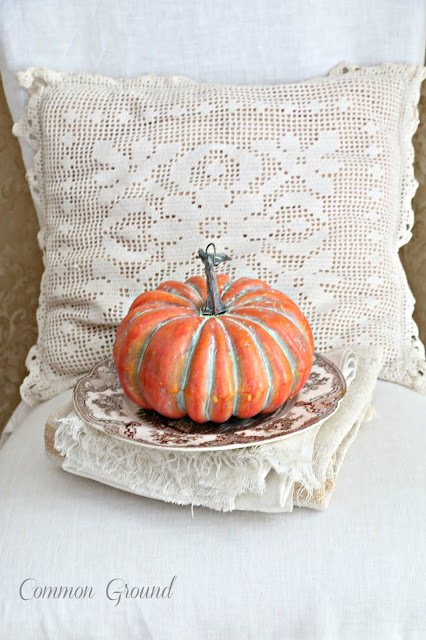 Love your table window box.....and your orange pumpkins that add a splash of fall color around your house. Love love love the chandelier, Debra, and the pumpkin in the chair. Of course everything always looks stunning in your beautiful home! I am looking forward to the Fall parties, thanks! I love it all, but especially your window box centerpiece. Thanks for sharing how you put it together. Beautifully done! The chandelier looks fabulous. I love your white box centerpiece- the shape of it is great! I filled my big basket centerpiece with bags too. I love the hydrangeas. I never would have thought to add spray paint to them for a different look. 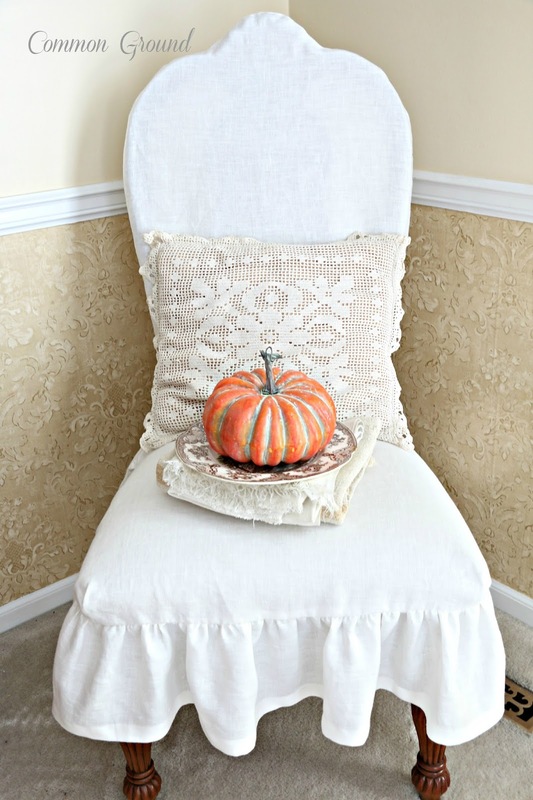 The chair with the pumpkin is so sweet! Love your room. A room full of gorgeousness, Debra! 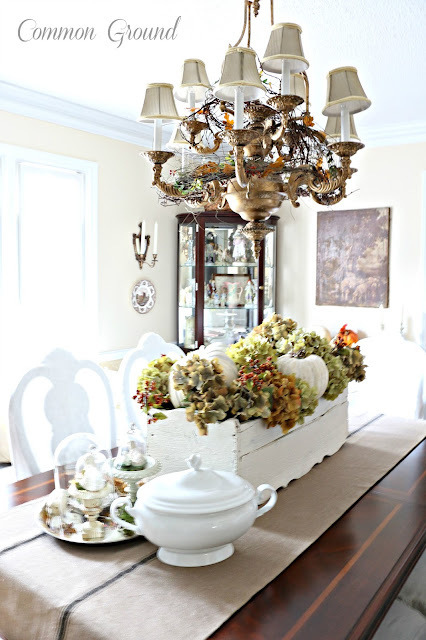 Love what you did with the chandelier and I'm drooling over the tureen!! Gorgeous room! Everything is wonderful! What a gorgeous home. You are an amazing designer. That chandelier and dining table are truly stunning. Your dining room looks beautiful all dressed up for Fall...love what you did with the chandy! 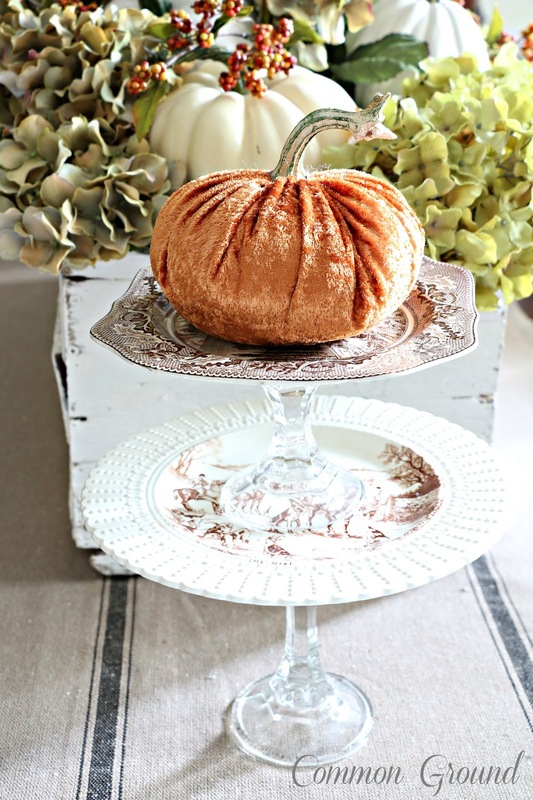 Wow, Your Fall décor is gorgeous!! I especially love the chandelier and the beautiful centerpiece. 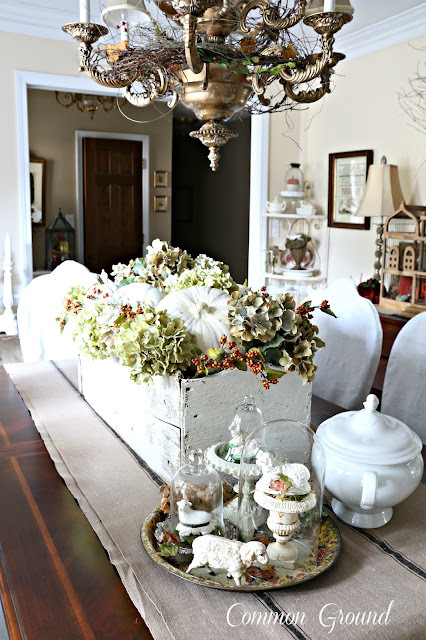 Debra, thanks for sharing your home decorated for Fall at the Open House party. Oh how I love your twig vine for the chandy. It just gives it so much character Debra and I like that you can keep it up for Christmas. The perfect fall accessory I think. Popping back to let you know I'm featuring that gorgeous chandelier at Shabbilicious Friday this week.